Hello All, This is just a friendly reminder that the Tai Chi classes in Pine Grove will be at 6:00pm Monday and Wednesday starting January 2, 2012. :) I hope to see you all there! I just wanted to let everyone know that starting in January 2012 at the KSW Karate Dojo in Pine Grove, CA evening classes in Tai Chi and Qi Gong will be made available. The classes will be held on Monday and Wednesday evenings starting at 6:00. If you have further questions please feel free to contact the KSW Karate Dojo at (209) 296-4200 or Contact Me. Can Tai Chi Benefit People with Fibromyalgia? People with fibromyalgia may benefit from practicing tai chi, according to a study published in the New England Journal of Medicine . Fibromyalgia is a disorder characterized by muscle pain, fatigue, and other symptoms. People with fibromyalgia have chronic widespread pain, as well as "tender points" on areas of the body, which hurt when slight pressure is applied. Although exercise appears to be an important part of fibromyalgia treatment, many people with fibromyalgia need medication to control symptoms and are unable to maintain muscle strength, flexibility, and overall fitness. Researchers, funded in part by NCCAM, evaluated the physical and psychological benefits of tai chi (which combines meditation, slow movements, deep breathing, and relaxation) in 66 people with fibromyalgia. The participants were assigned to one of two groups: an attention control group that received wellness education and practiced stretching exercises, or a tai chi group that received instruction in tai chi principles and techniques and practiced 10 forms of Yang‑style tai chi. Both groups met in 1‑hour sessions twice a week for 12 weeks and also practiced daily at home. Tai chi participants used an instructional DVD to continue practice for 12 more weeks. Compared with the attention control group, the tai chi group had a significantly greater decrease in total score on the Fibromyalgia Impact Questionnaire at 12 weeks. In addition, the tai chi group demonstrated greater improvement in sleep quality, mood, and quality of life. Improvements were still present at 24 weeks. No adverse events were reported. The researchers concluded that these findings support previous research indicating benefits of tai chi for musculoskeletal pain, depression, and quality of life. The underlying mechanisms are unknown, and the researchers noted that larger, longer term studies are needed to evaluate the potential benefits of tai chi for patients with fibromyalgia. Yeh GY, Kaptchuk TJ, Shmerling RH. Prescribing tai chi for fibromyalgia—are we there yet? New England Journal of Medicine . 2010;363(8):783–784. Interesting Article About the Effects of Vitamins on Lung Cancer. (OMNS, Nov 18, 2011) A recent study  of the effect of B vitamins on a large group of participants reported an inverse relationship between blood serum levels of vitamin B6, methionine, and folate and the risk of lung cancer. High serum levels of vitamin B6, methionine and folate were associated with a 50% or greater reduction in lung cancer risk. This exciting finding has not been widely reported in the media, but it confirms a growing body of evidence gathered over the last 40 years that B vitamins are important for preventing diseases such as cancer. Product of the Month for November 2011 - Pure Trim Truffles? I just got back from the "Rise and Shine" Qi Gong session in Detert Park and it was really, really refreshing. :) Thank you to all those who came out to rejuvenate your mind and body with me! The weather this morning was a little strange, but all that Qi Gong has me feeling wonderful and ready for the weekend in spite of the odd weather! It's happening again. :) This Saturday in Detert Park I will be hosting another "Rise and Shine" Qi Gong Session for everyone to come enjoy. Bring comfortable clothes, and light jacket, and a friend to this "Weekend Recharge." This will help you relax, rid yourself of the problems of the week, and revitalize your mind and body so you can fully enjoy your weekend. Qi Gong is an ancient breathing, meditation, and exercise art from China that is practiced in parks all over China every morning to refresh and rejuvenate its practitioners. There is no charge for this session because I want it to be available to everyone. We will be starting at 6:30am on Saturday (Aug. 27) and will go anywhere from 30 minutes to an hour depending on how much fun we are having. For any questions Contact Me. We will be talking about products from Amador County’s Online Health Food Store (Andrew.AwarenessHealth.com) that are wonderful for helping people reach their healthy weight and lead healthier, more energized lives. There will be samples and free booklets with healthful, “weight conscious” snack and meal ideas available for everyone who comes. So if you're ready to fit back in your favorite jeans or bathing suit, or just want to have more energy throughout your day, come check it out and bring your friends. :) We hope to see you there! 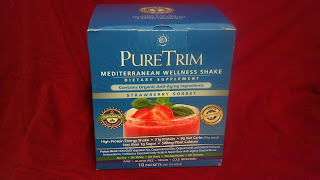 This month's "Product of the Month" is the Pure Trim - Mediterranean Wellness Shakes. They are high in nutrition, boasting ingredients like 50% of your daily Vitamin D, A, and E intake, B12, Biotin, and many other nutrients. It also contains a Protein Complex that is soy and whey free, an Essential Fatty Acids blend, Anti-Stress and Energy blend, a Skin and Digestion blend, and even a Super Greens blend.......there's quite a bit more in them, but I don't want to bore you with an ingredients list here. :p In fact, people seem to discover the ingredients on there own after they try these shakes for the first time. As I mentioned before I used these shakes while I was training in China to keep my energy up so I could keep up with the intense training schedule and I still use them to keep my energy up without having to use drugs like caffeine. But these shakes can be used for more than just energy and nourishment, they can also be used as a means of healthful weight loss. Instead of starving your body to lose weight they nourish your body to its healthy weight and keep you going strong while doing so. 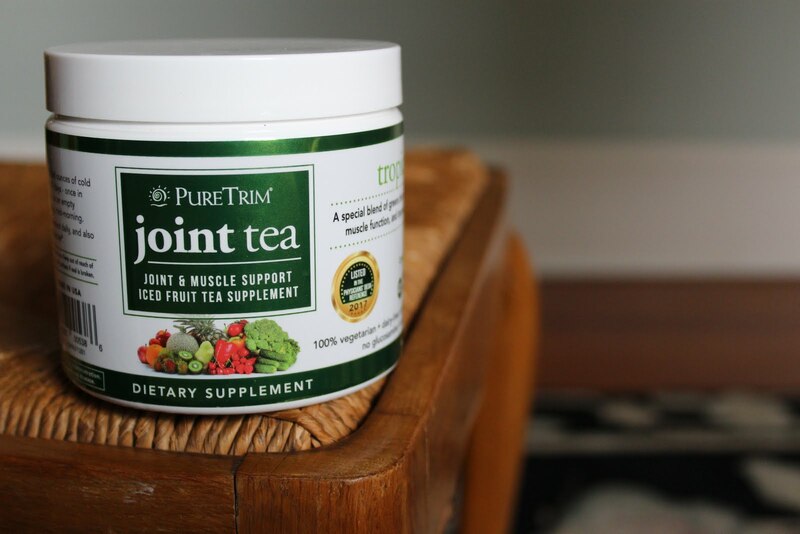 One of my friends and carido kickboxing students uses Pure Trim and loves it. A few months back she let me post her story so everyone would know how they have changed her life. Click here to read her story. If you know anyone who would be interested in learning more about a product like this have them check it out on Amador County's Online Health Food Store. Or if they contact me I would be happy to give them a shake to try for them self. You can also check out some of the celebrity fans of this product by clicking here. Everyone (including me) had such a great time at the "Rise and Shine" Qi Gong session in Detert Park last Saturday that we are going to have another one this Saturday (Aug. 6). Same time (6:30am) and same place (Detert Park). Qi Gong is a great way to unwind, de-stress, and revitalize your mind and body. What a perfect way to bring the week to a close and start the weekend fresh. :) Just like before, there is no charge because I want everyone to have the chance to enjoy this session, but I will accept donations. After we were done everyone who came told me how much better they felt, how much more alive they felt, and how happy they were that they came. :) Hearing that thrilled me because that was the whole point of this early morning session. If that sounds like a way you want to start your weekend come join us for the next "Rise ans Shine" Qi Gong session. I'll post the time, date and location soon. So stay tuned. :) I hope to see you there. 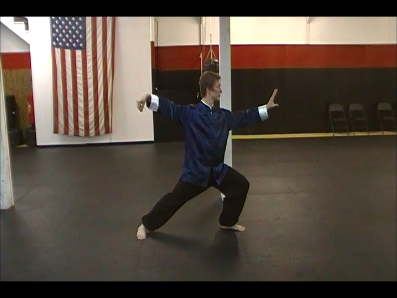 This first photo is from the Qi Gong section of the DVD. In this photo I'm explaining how to do the Qi Gong exercise called "Sink the Qi to the Dan Tian"
I'm actually taking a break from editing right now to post these pictures, but I thought you all might enjoy seeing them. :) I'll keep you all updated as this project progresses. I've been working on a sash ranking system for my Tai Chi classes to add a little more structure to the way the lessons are taught and this DVD covers the requirements needed to get a white sash. A simple warm up set similar to what we do in class. It also includes our normal Tai Chi cool down exercise set which can be used after any work out or first thing in the morning to wake up and vitalize the body and mind. All of these, except for the warm up and cool down exercises are requirements for the White Sash in the ranking system I am putting together. I'm really excited about getting this all filmed today. Because these products have to do with health, and not national independence, the freedom I'm referring to is the freedom of a person's body from toxins. Detoxing has been a big subject amongst health gurus for many years and it's importance is recognized by many health care professionals. If your body cannot adequately eliminate the waste it produces, that waste accumulates and starts to break the body down from the inside out. The Colon is one of the body's main waste elimination systems and it is used to move many toxins out of the body. If the colon is working correctly it will help move toxins out of the body before they get the chance to start causing damage. If the colon is not working correctly, however, then these toxins can begin to build up in the body and cause problems. Dr. Anthony Badzier, after conducting a 25-year study with 5,000 cases, said, "...intestinal toxins are the most important primary and contributory cause of many health problems of the human body." The Product of the Month for July of 2011 is Experience. It's made of natural Mediterranean herbs that are blended together to make a formula that has been used in the Mediterranean for over 100 years to cleanse the colon and promote healthy colon function. If you know anyone that's interested in detoxing their body, have them check out Experience on Amador County's Online Health Food Store. Detox your body and cleanse your colon with this Mediterranean herbal recipe. Ancient Wisdom for The New You is proud to present Experience as Product of the Month. Click Here for more info. When I posted the picture of Eric Lee and me I mentioned that I also had a picture taken with a Grandmaster in Chinese Martial Arts that had attended the tournament. That Grandmaster is Ming Lum who is considered the Godfather to Two Generations of Wushu (Martial Arts) masters. I was completely honored to have the chance to meet him and have our picture taken together. Here's the picture. 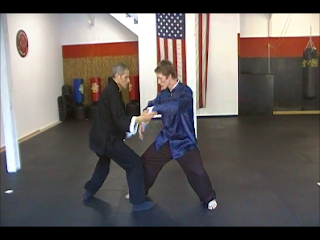 If you aren't familiar with Grandmaster Ming Lum here is an article where he is interviewed by Kung Fu Magazine. Good News About the Tuesday Afternoon Tai Chi Class at NYF. I just got an e-mail from Natalie (Fitness Manager at New York Fitness) saying that we can continue the Tuesday afternoon (4:00 to 5:00pm) Tai Chi Classes through the end of July! :D How awesome is that?! Here's a picture of the medal I got at the tournament yesterday. Here are "Before and After" photos of a good friend of mine who is one of my cardio kickboxing students and one of my weight loss clients. 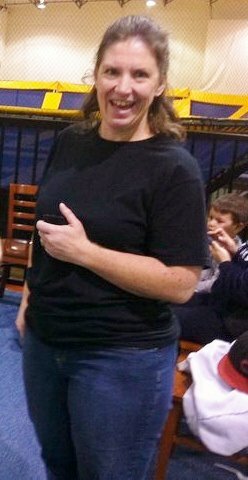 She said that since she started on my weight loss program on May 23, she has lost 15 inches, 5 of which are from her waist! :D Awesome job Andrea!!!!! She said I could post before and after photos so you all could see some of the progress she has made. In the last installment of the Self Control? (Self Control? Part - 3.2) blog posts we discussed how meditation increases circulation and activity in the part of the brain that is responsible for self control and good reasoning abilities. We talked about how Tai Chi is practiced by millions of people every day as a moving meditation and we asked what about Tai Chi (compared to other forms of meditation) is so special? Well, one of the things that sets Tai Chi apart from many other forms of meditation is that when you practice Tai Chi, you are not only getting benefits from the meditation (which strengthen the self control and reasoning center of the brain), but you are also exercising and strengthening your body at the same time. Exercise helps increase blood flow to the brain and helps keep the body and mind younger longer. So rather than just receiving the benefits of meditation, or just the benefits of exercise, Tai Chi provides the benefits of both. In addition to those benefits, practicing Tai Chi requires learning to move your body in ways most people are unfamiliar with and begins to improve coordination. This is an entire workout for your brain in and of itself which helps keep your mind active and sharp. So, Tai Chi offers a very "whole being" approach to health. Instead of the focusing solely on the body or mind, it brings both into the mix and allows you to exercise, calm, and develop both at the same time. That is one of the reasons I personally prefer Tai Chi over many other forms of meditation. Sometimes this brings up questions about whether someone should practice Tai Chi instead of some of the various other forms of meditation available? To me, this very much depends on a person's personal preference. One person might enjoy Tai Chi more than they enjoy, say, yoga and another person might enjoy yoga more. So, rather than saying you should do Tai Chi instead of something else, or that you should do something else instead of Tai Chi....I would say, try them both and see which one is a better match for you. A very important thing to remember when studying any meditative art form is that there is no single art that is perfect for every individual person. If you would like to give Tai Chi a try check out my Class Schedules and Locations to see when might be the best time for you to try it. Feel free to send me any questions or comments you may have. P.S. The following links will take you to the previous "Self Control?" blog posts if you missed any of them. Since this blog is about helping people improve their health I've decided to add something new to help with that. Each month I will be featuring a "Product of the Month" from Amador County's Online Health Food Store to spread the word about what's available at this online health food store that might help people improve their health. My Dad Just Got His Tai Chi Uniform! Looks pretty awesome, doesn't he? When I first began studying martial arts, at the age of 13, I heard that they could help improve a person's self control and I thought, "Well, that's just ridiculous. If someone wants to have better self control they just need to make themselves do what they know they need to." ha ha! This, of course, was the wisdom of a jr. high student.....fortunately I have learned since then that this can be as foolish as saying, "If anyone wants to be able to lift 300 Lbs. they just need to make themselves do it." ...it's not always that easy. Why? Because we are all different. We have all developed differently mentally and physically. If you see a super skinny person try to lift a 300 Lb. weight and fail you would think very little of it. You would say, "Well, it's clear that their body is not strong enough to lift that weight." But what if you see someone make a bad choice, swear to never do it again, and make the exact same choice before the week is over? We tend to judge that person more harshly. We say they are "this" or they are "that" and "why can't they just figure it out?" This is because with the skinny person we can physically see that they are not strong enough to lift 300 Lbs., but with the person making bad decisions we can't see their brain or how it works so we can't logically explain their illogical behavior. However, one of the greatest aspects of our human bodies is that our bodies will adapt to whatever we frequently do. In other words, that skinny person may not be able to lift 300 Lbs. today, but they could probably lift 1 Lb. or 5 Lbs. and if they continue to do that, eventually they will be able to lift more and some day, if they stay consistent, they will no longer be a super skinny person and they will be able to lift that 300 Lbs. In the same way, if someone doesn't make good life choices and they keep repeating the same mistakes over and over, they can start by do things to stimulate their prefrontal cortex (the part of the brain that's responsible for making good decisions) and eventually, when they have "strengthened" that part of their brain, good decisions will just make sense, instead of being something they are striving to achieve. Since I began studying martial arts I have seen improvements in my self control and the self control of other students, particularly when studying meditative practices like Tai Chi. Learning that meditation can increase blood flow to and activate the part of your brain that is responsible for self control is what connected the dots for me. Tai Chi is often described as a moving meditation and, when practiced as such, can have the same positive effects on the mind as any other meditation. So, one of the main ways that Tai Chi can help improve a person's self control is by stimulating and strengthening their prefrontal cortex, which allows their brain to work better when it comes to decision making. P.S. for those who are just joining this blog, here are links to previous Self Control? blog posts. Just FYI. 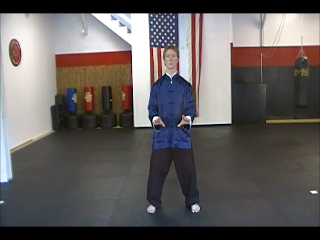 There will be no Tai Chi class at New York Fitness on Monday, May 30 for Memorial Day. All classes will resume as usual on Tuesday, May 31. I just wanted to let everyone know. :) Please comment if you have any questions. Here's the video of my Tai Chi form. This is supposed to be Self Control? Part 3, but as I was writing it, it became a rather enormous post. So, I've decided to break it up into a "Part 3.1" and "Part 3.2" To make it a little easier on everyone to get through. :) Enjoy. Last time we discussed how simply going to a Tai Chi class and participating can help improve self control by building a habit of self control, but we also mentioned that this might not be enough to give someone a real discipline boost. If that is all there is to improving self control through Tai Chi, then what makes Tai Chi any different from any other form of exercise? Habitual self control (or self control that is produced by doing something so much it just becomes a habit) can be attained in almost any exercise program, diet program, financial planning program, etc.....the trick is sticking with it long enough for it to become a habit instead of a failed attempt. So what is the missing piece? Does Tai Chi have that missing piece? Well, lets take a little look at the brain and get some ideas about how a meditative art like Tai Chi affects the brain. Perhaps this will help us better understand how an art like Tai Chi can help improve self control when many other exercise programs may not. Some of you may already know that how your brain works has a lot to do with how you handle day to day life, and whether your decisions are something to be proud of, but few people realize that their brains can be trained in a way that will increase their ability to function more effectively in decision making and life choices. To learn more about how our brain works let's look at some information From Dr. Daniel Amen on the subject. Dr. Daniel Amen is a physician, child and adult psychiatrist, and brain imaging specialist who studies how the brain works and how it affects human behavior. He is the author of the New York Times bestseller Change Your Brain, Change Your Life and below are some statements he has made about how our brains affect our choice making abilities. "Meditation is a wonderful tool to calm your mind and boost your brain at the same time. Meditation actually fooled us. Initially, we thought it would calm brain activity. What we found was that many different forms of meditation actually dramatically increase blood flow to the brain. Last year we published a scientific study showing how a very simple 12-minute meditation boosted blood flow to the prefrontal cortex, the same area of the brain that helps you make good decisions." I saw this short video on youtube about Tai Chi in China and I wanted to share it with you all. :) Check it out. It's only like a minute long and it gives a good brief description of Tai Chi. In Self Control? Part 1 we asked whether Tai Chi can actually help someone improve their self control. I mentioned how I had seen it do so for several people and we asked how it might be responsible for such positive changes in those people. Self control is definitely a habit, just like a lack of self control is a habit. Our bodies and minds are so adaptive it just amazes me. If we choose to do something over and over, pretty soon our minds are programmed to do that same thing every time we have the chance. Well, this is part of the reason self control can be so difficult for many people...........many of us have developed a habit of not being disciplined. For some people the kinds of food they eat is where their discipline habits are most evident. They know they should eat better, but they have developed eating habits since the time they were little and when meal time comes, their body is just programmed to grab for certain foods and not for others. It's the same with people who eat really well. They have been doing so for a long time and they don't even consider the junk foods they used to eat because they have reprogrammed themselves...........or they have just always eaten that way, but either way, they have a developed habit of good food choices. When it comes to discipline and self control most people notice that when they become more disciplined and self controlled in one area of their life it tends to spill over into other areas as well. This is probably the most basic aspect, or even possibly the "first part", of how Tai Chi can help a person develop greater self control in all areas of their life. When a person attends a Tai Chi class and follows the instructors directions and spend that whole class duration trying to improve their Tai Chi skills, there is a good bit of self control that they must practice......usually even without their direct knowledge. Generally that self control hides itself as "manners" or "normal behavior" because when someone takes a Tai Chi lesson they generally realize it's a much better work out than they had previously imagined and when their legs start to get tired and they start to sweat, they exercise self control by not quitting in the middle of practice. To most of us it's just obvious that you don't sit down and quit practicing something that you are taking a class to learn, but it is practicing self control to follow that "common sense" about how to behave in a class. That's why it is somewhat "hidden self control practice", but it begins to develop a habit of self control and discipline that can eventually begin to spill over into other areas of our lives because it starts to "reprogram" our brains and bodies to be self controlled for, at least, a couple hours a week. But that can't be all there is to improving self control through Tai Chi, right? Probably not, considering most people try very hard to start new classes and new habits all the time and fail. They try to go to a class or practice every day, but sometimes they don't feel like it, or they stay really consistent for a long time then all the sudden just don't want to, or don't feel like they can, keep doing whatever their new endeavor may be. We see it in diets and exercise programs all the time. People start, last for a while, then quit and it's not because they didn't have enough time to form new habits either.....not usually anyways. There seems to be a missing ingredient somewhere......what is it? And can it be found in Tai Chi? Here's a video that a friend of mine took while I was showing my form. It was great getting to see some of the students from the KSW Karate Dojo compete as well. They did karate forms and sparring and they did a great job too! I was very proud to be with that group representing Amador County. If you live in Amador County and you would like to learn Tai Chi, feel free to contact me for more info or Check out my Class Schedule to see if you can make it to one of the classes I teach. Ancients Arts from the Orient Available to You! This is will be my first entry on this blog and I'm very excited to be posting it. I have just returned from an extended stay in China where I was studying Traditional Chinese Martial Arts. My goal here is to focus on the many health benefits of these martial arts and give instructions and exercises for people to practice at home. I also want to use this blog to keep people up to date on local classes that I will be teaching and to keep people up to date on the latest news in my nutrition business. It's going to be fun and I'm looking forward to getting started. The first order of business today is to keep those who live in the wonderful community of Amador County, CA up to date on classes available to them. The second piece of news for those who live in Amador County is that I will be teaching a Tai Chi and Qi Gong class every Tuesday and Thursday morning at the Ko Sutemi West Karate Dojo in Pine Grove, CA. These classes will be from 8:30 to 9:30 and there will be a little more focus placed on the martial applications of Tai Chi, but this class will still offer the previously mentioned healthful benefits. For questions about this class, contact me. 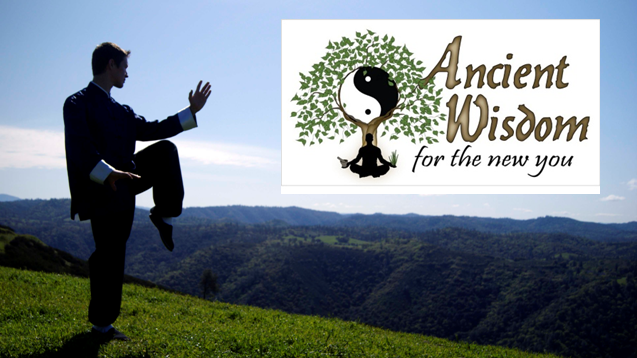 So... that takes care of all of my Amador County family, but what about everyone else out there that would like to experience the health benefits of Tai Chi and Qi Gong? What can I do for you guys and gals? Well, I've thought about it (and while it's not official yet) I'm planning to start a podcast or series of videos that you can watch online or download for free that will give you lessons to practice in your spare time. They will never be able to replace the kind of teaching you can get from an instructor in a one-on-one environment, but it'll be something you can use at home until you can find a good instructor. I don't have a lot of details on this yet, as it is still very much in the development stages, but I wanted to give you all a "Heads up!" to stay tuned and ready for more updates on this project. :) It's really got me excited and I hope, when I get it going, it will be a big benefit to you all! Now, for those of you who are thinking, "What in the world is Qi Gong?..........and isn't Tai Chi a drink at Starbucks?" do not fret. If you are completely new to both of these arts and aren't quite sure what kind of blog you've stumbled across, I am working on a post that will explain each art and give you a basic foundation for understanding these arts. Pretty lame stuff, right? Yet everyone seems to have an ample supply with plenty in reserves just in case they happen to have a peaceful day sometime during the year. It's not that any of us like stress, but so many of us have stressors piling on more stress every time we turn around it almost seems like there is not escape. The boss is upset about something, we need a job, the kids spilled grape juice on the new carpet, we have to fill up a 20 gal. gas tank with gas prices going through the roof....you name it, stressors are all over the place. So, since we cannot simply tell the world to go away and to stop being stressful, one of the best things we can do is learn to release the stress that we have accumulated during the day. Some people choose to do this by taking part in activities that simply add more stress. Although they may be fun and seem to reduce stress at the moment, they often tend to create an imbalanced lifestyle of constantly pushing yourself. In the long run such a lifestyle tends to lead people to a place where they just feel burned out and apathetic towards life. One of the worst parts of this whole mess is that most people that are stressed have become so used to it that they don't even realize they are stressed. Their body is full of tension and they don't even notice it anymore. I've taught Tai Chi to students like this. I will tell them to relax their shoulders while they are standing in a certain posture, but they are so used to the tension they carry around all day that they look at me with a puzzled look and say, "My shoulders are relaxed." Which, to them, is true because they don't remember what relaxed feels like, but it is very easy to see that their shoulders are anything but relaxed. Sometimes placing my hands on their shoulders and telling them, "Focus on these points and try to relax them a little more each time you exhale" is all it takes to get them to actually relax their shoulders (some times it takes more than that), but they are always surprised by how much tension they were actually carrying when they do finally relax their shoulders. Often the exact words they use to describe the difference are, "Oh wow..." Simply by letting go of some of the tension they have stored up for years they immediately feel like a new person. I want to teach you a simple breathing exercise that will help you get rid of some of your stored up stress. You might be wondering, "How is breathing going to get rid of tension in my body?" It's pretty simple. In the same way that you can use your mind to stress out about something or worry about something to the point that you give yourself an ulcer (or any number of other health problems caused by stress) you can use your mind, on purpose, to have a positive effect on your body. Simply by changing what you are focusing on for a short while you can give your mind and body the little "vacation" they need to keep on going. You can sit in a chair, cross legged on the floor or on a pillow, or even stand to do this breathing exercise. Regardless of which way you choose to do this you will want to make sure your spine is straight. Start by tucking your chin in slightly, and tilting your hips slightly to straighten out the curve in your lower back. You can imagine that your head is filled with helium and is being lifted gently upward. This will help straighten and alleviate the feeling of pressure on your spine. If you are standing you will want to keep a slight bend in your knees. Next place your hands on your lower belly about an inch below your belly button. For females place your right hand on your lower belly then place you left hand over top of it. For males place your left hand first, then your right hand on top. Once you are here imagine all your weight and every bit of tension sinking down to the lowest part of your body then imagine that your tension is draining out into the ground. Start by closing your mouth. For this exercise you will be breathing in and out through your nose only. Place the tip of your tongue on the roof of your mouth (this is important in Chinese medical theory because it connects two of the bodies meridians and allows the body to adjust and balance out more easily) When you breathe in through your nose imagine you are pulling that breath all the way down to where your hands are on your lower belly. Keep your shoulders relaxed as you do this. Instead of drawing your breath into your chest and expanding your rib cage, keep your chest and shoulders relaxed and expand your lower belly as you inhale. When you exhale bring your lower belly in as you push the air out of your lungs, but continue to keep the chest and shoulders relaxed and move them as little as possible. In Qi Gong they say that your breathing should be quiet, thin, and smooth like a silk thread. You should not be able to hear it and it should not have an ending or a beginning. Your inhale should smoothly turn into your exhale and vice-versa. Try to breathe deeply and slowly. Long, steady, smooth inhale and long, steady, smooth exhale. When you are doing this simply start by counting your breaths in sets of 10. Usually you will want to do at least 20 breaths per session, but you can add more if you feel so inclined. So with your first inhale count "1" in your mind and follow that breath all the way to the lower belly with your mind, then follow it all the way back up and out your nose. Do the same thing over and over until you reach "10" then start counting at "1" again. While you are doing this the mind will tend to wander and will try to pull your attention back to the things that it has been worrying about or thinking about all day. Our minds are very often unaccustomed to silence. If thoughts begin to pop up, don't try to force them away, just let them pass by and continue to focus on just your breathing. After a while of practice your body will become more relaxed and your mind will feel more relaxed and more focused at the same time. It probably won't take you more than 10 mins. to go through all 20 breaths so this exercise is something you can use to focus your mind and prepare yourself for the day or as a way to calm down and relax after a long day. 10 minutes is definitely worth it if it can help you maintain your health, or counteract some of the effects of stress on your body, right? Good news for those of you who would like to come to Tai Chi and Qi Gong classes, but can't make it to morning classes. I just met with the lady who runs the Sierra Ballet School on Main St. in Jackson and I will be able to hold a class there on Thursday evenings from 6:30 to 7:30 starting on February 3, 2011. We have discussed doing Tuesday evening classes also, but that has not been solidified yet. I will keep you posted on all future developments. Here's a link to my Class Schedules and Locations for more info. Here is an interesting article that points out eight common things that people do that actually cause them to have less energy during the day. I found it interesting and thought you all might like it too. Yesterday morning (1-18-11) marked the third Tai Chi and Qi Gong class held at the Pine Grove Ko Sutemi West Karate Dojo. It was a small class, but still a blast. At the not-so-early hour of 8:30am class began and the students who were there began working on several of the basic movements that will prepare them for practicing the art of Tai Chi. The dojo, with its support posts standing proud down the center of the room, has the feel of an old traditional dojo, almost like something you would see in the movies. With the crisp cool air outside and the still quiet feel of a room meant for the improvement of the mind and body, we began to move. The slow meditative feel of Tai Chi lending a still, calm inward feeling to match the peaceful feel of the room. After working on several basic motions and beginning to develop a feel for the art of Tai Chi we focused for a while on foot work and the meanings of the movements, then brought the class to a close with Qi Gong that relaxed our bodies, increased circulation, and cleared and rejuvenated our minds. Some people wonder what the benefits of an art like Tai Chi can bring them. many of us have heard about Tai Chi on the television, or in the news, but never really understand what it is or what it has to offer. Below I have copied an article from the Los Angeles Times that does a great job of describing several of the benefits of Tai Chi. I hope you enjoy the read. painful and often persistent nerve inflammation called shingles. increases the flow of blood and oxygen to the brain. answer that question, Monjan said. allows it to reawaken and inflame nerves. health instruction, was striking, Irwin said. not practice tai chi by the end of the study. chronic conditions that accelerate with age. balance and had become a welcome, meditative part of her day. "We feel in harmony" after conducting the slow-steady dawn sessions, Smith said.